Review: "Black Stone Cherry: Between The Devil And The Deep Blue Sea (Special Edition)" - Sea of Tranquility - The Web Destination for Progressive Music! With their third album Black Stone Cherry shows that they are one of the most consistent hard rock outfits out there. Continuing with their blend of Southern tinged heavy metal along with some more radio friendly fare, BSC has released one of the real feel good albums of the year. This one is going to be the album that you hear played wherever you go. With anthem like rockers and the catchy choruses that everyone will be singing, I do believe that this will be the album that pushes Black Stone Cherry into the forefront of the hard rocking world. They are one of the really talented bands out there and the infections music that they deliver is on a par with anyone in the genre. This has been a much played disc around the Ward household and anywhere else that my mp3 player and I roam. Kicking off the disc with the somewhat redneck sleaze rocker "White Trash Millionaire", BSC starts you off with an anthem that will be going through your head continuously whether you want it to or not! Get ready though because this is going to be a major problem with this album. Most of the music is of the variety that lingers in the memory and is not easily replaced. 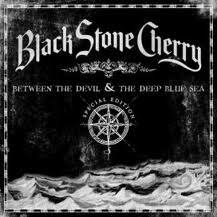 Speaking of variety, that is another aspect that Black Stone Cherry brings to the table with this release. From metal moments to melodic ballads and even a potent remake of the Marshall Tucker Band's "Can't You See" BSC gives you the whole spice rack when it comes to different flavors of music. You will never be bored or disappointed by what they throw at you because the one common bond is that everything they deliver is of the highest quality. Hard rockers like the lead off track and "Such A Shame" sate the headbanger in me while songs like the touching "Won't Let Go" and "Like I Roll" have that good time feel similar to Bob Seger or maybe even Kid Rock. These are the summertime cruising tunes and BSC gives you the proper fuel for the trip. For a little bit of sentiment the band tugs on the heart with the gripping power ballad "Stay" and then they give us all a little bit of Southern small town philosophy with the storytelling of "All I'm Dreamin' Of". No matter what they give you it is entertaining and lyrically they have the ability to push all the right buttons as much of the subject matter they deal with is something that each and every one of us has dealt with at some point in time. This has been easily one of the most enjoyable listens I have had this year. Fans of Skynyrd, The Black Crowes and even Kid Rock and Bob Seger will find this disc very much to their liking. This album is as American as apple pie and just about as tasty. Do yourself a favor and grab it. There is not enough of this feel good rock and roll around and when you find some that is this much fun you should keep it close, you never know when you might need something to put a smile on your face! Black Stone Cherry certainly have all the attibutes to be major, major stars on the modern rock scene. At times they are bone crunchingly heavy like Black Label Society or Down, yet they also can touch on the more commercial aspect of a Kid Rock or Nickelback. More importantly, the band channel their inner Southern Rock leanings towards Lynyrd Skynyrd or Blackfoot at times as well, making for an interesting mix that is quickly catching on with the masses. All these elements are on display here on their latest Roadrunner release Between the Devil and the Deep Blue Sea, a satisfying collection of hard rock, metal, southern rock, and country pop. Tunes like "In My Blood", "Won't Let Go", "Like I Roll", and "Let Me See You Shake" have that contempory Lynyrd Skynyrd meets Kid Rock swagger, a great mix of Southern Rock/hard rock/country pop, but it's the driving, bottom heavy metal tinged numbers like "White Trash Millionaire", "Killing Floor", "Blame it On the Boom Boom", and "Change" that will really get your blood pumping and your fist in the air. Filled with crunchy guitar riffs and spot on vocals, these are perfect examples of modern heavy rock with an attitude. Look for a wild 'n' heavy take on the Marshall Tucker Band classic "Can't You See", as Black Stone Cherry give this FM radio staple a good ride, making me wish they'd do a Southern Rock covers album at some point in the future to see how they'd work other genre classics. Though some of the slick & sweet vocals on certain songs might turn off some of the metal crowd, Between the Devil and the Deep Blue Sea pushes many of the right buttons and ultimately is a CD that crosses many genres and should appeal to a wide audience. The next 'rock saviors' ? We shall see, but in a perfect world this album and band should be huge.